Shaving is a daily ritual for many guys, and can be a way for men to have some self care in their day. A little bit of self love is necessary for a happy spirit. This daily ritual can also expose men to harsh chemicals, making it all the more important to keep the products they use clean and green. 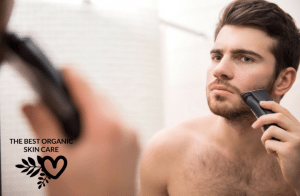 Organic shaving products for men are gaining popularity as men are becoming more aware of the daily exposure to synthetics through their personal care products. Men like having soft skin, and women like it too (am I right ladies?). The key to a great shave and baby soft skin, post-shave is having the right technique as well as the right products. Products can help prepare your skin for shaving, lift hairs up for a clean shave as well as treat the skin after the shave. They can minimize irritation and prevent redness, calm cuts, and ease itchiness. We will discuss what types of products men need for a great shave, with a recommended kickass organic product for each one. I thoroughly read each products ingredients list, to make sure I was only sharing those that are truly natural and do not contain any questionable ingredients. This prepares your skin for shaving, getting rid of any dead skin cells on your face as well as encouraging any hairs hiding in the surface of your skin to stand up. 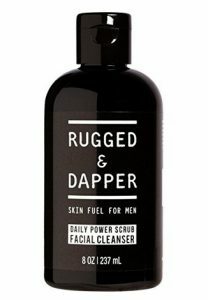 We Recommend: Rugged and Dapper Skin Fuel for Men – A multi-purpose toner, scrub, and wash, it contains natural plant based exfoliants including circular Jojoba beads which are very gentle on the skin, yet highly effective at removing unwanted dirt & grime. Pre-shave oil is applied before a lather, it will soften your facial hair as well as open pores, ensuring a close shave. The oil will penetrate and moisturize the skin, making it as supple as possible and minimizing cuts. The best shave-oils use natural plant oils such as coconut, sunflower, grapeseed or olive oil. Antibacterial agents, such as essential oils can help prevent breakouts and cleanse any cuts. 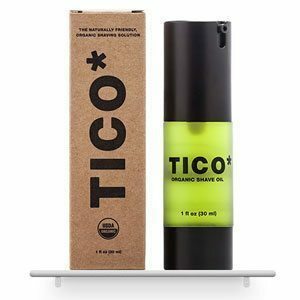 We Recommend: TICO organic shave oil is a blend of natural and organic oils meant to prepare your skin for a great shave. It is excellent for sensitive skin. Comes in a travel-friendly bottle. Help the razor do its job with a good lather. Lathers work to cushion the skin from the razors blade while keeping your stubble – and face – from drying out. Most mainstream lathers contain alcohol, which dries out the skin. It’s no wonder some guys despise shaving – they are using the wrong products! Avoid alcohol in your skin care, please. There are 4 types of lathers: foams, creams, soaps and gels. We won’t even talk about foams because they are drying and irritating. Creams are rich and hydrating. They lubricate the skin and allow the blade to glide effortlessly over it. They also lock moisture into the skin, softening and soothing it after the shave. Creams rinse easily from your shaver’s blades. For best results, massage with hands or a badger brush for a full minute. Look for creams with ingredients to help heal the skin and keep it from drying out such as aloe or glycerin. 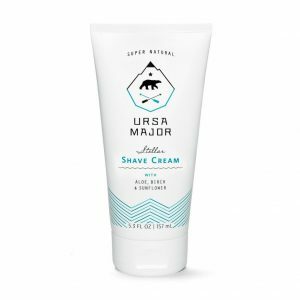 We Recommend: Ursa Major Stellar Shave Cream – concentrated, nourishing, non-lather cream to nourish your skin and help give you an effortless shave, it also smells amazing. Shaving soap is a traditional lather for shaving. The soap must be lathered up in a bowl and put on with a brush. Soap does a great job if you lather well enough, but it can be drying to the skin. Look for a soap that contains nourishing oils to hydrate and protect. 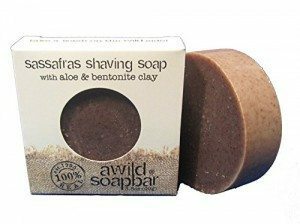 We Recommend: A Wild Soap Bar Sassafras Shaving Soap – So many natural shaving soaps still contain synthetic fragrance – this is a big no-no, the term, “fragrance” can hide all sorts of chemicals. A Wild Soap bar is free of synthetic fragrance (they use essential oils to add aroma). This soap bar lubricates and softens the skin. It doesn’t produce a huge lather, because it contains clay, but it works and comes highly recommended by many people. Gels are becoming more popular, they are gentler than soaps and also make the skin slippery to maximize the razors glide. People like them because they tend to be transparent, making it easier to see the hairs underneath. They do have some disadvantages, they don’t rinse off the blades as easily and can be pore clogging. We Recommend: Dr Bronners Shave Gel – smooth and effective without harsh ingredients. Organic and vegan ingredients create a rich, moisturizing lather. Works best with a shaving brush. A badger brush is essential for a great shave. they create a perfect, creamy lather – while also exfoliating, and getting your hairs to stand up, ready to be shaved. Once you use a brush, you will never go back. Badger hair is soft and flexible and makes the best shave brush. There are 4 grades of badger hair, with each grade being more expensive. Pure Badger – Coarser in texture than the other grades. Will last an average of 3 years. Best Badger – Softer than Pure, will last about 6 years. Super Badger – Soft on the face with no scratchiness, this grade can last up to 10 years. Silver-tip – The best and most expensive, it is gentle and luxurious. Will last 10 years or more. 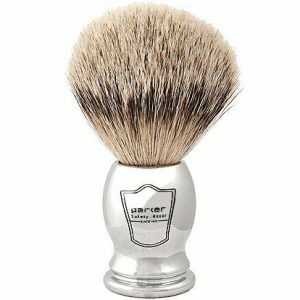 We Recommend: Parker Silver-Tip Badger Shaving Brush – The softest bristles you will find, a true luxury shaving experience. After you have shaved you want something that will relieve burns, razor bumps, dryness and help heal any cuts. Aftershaves are usually heavy on alcohol and can be drying to the skin. Aftershaves work because their astringent properties help combat irritation, while their antiseptic properties prevent cuts from getting infected. Remember to not overuse, only a little is needed to get the job done. Look for an aftershave with witch hazel instead of alcohol, for a less drying effect. 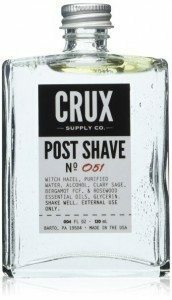 We Recommend: Crux Supply Co. Post-Shave Tonic – Witch hazel is the first ingredient. This post-shave tonic contains no synthetic fragrances, parabens, or toxic chemicals. It is soothing and conditioning to the skin. Highly recommended. A good shave balm will rejuvenate the skin, reduce redness and irritation, while relieving dryness and itchiness. Balms are intensely hydrating, soothing razor burn and preventing ingrown hairs. Look for balms containing Aloe and plant oils. Vitamin C and E are excellent regenerative ingredients. We Recommend: Herbal Choice Mari Organic Aftershave Balm – Certified organic aftershave balm. Soothing and moisturizing with no synthetic fragrances. Made with pure, cold-pressed oils, this aftershave balm is good for all skin types and is especially suited to those with sensitive skin. Our skin needs hydration. Shaving can make your skin dry so a moisturizer may be an essential step in your routine. Throw some anti-aging properties into your moisturizer and you’ve got yourself a practical finish to your shaving experience. Give your face a cool splash of water to close up your pores before applying. We Recommend: John Masters Organics Eucalyptus and Agave Aftershave Moisturizer – lightweight but powerful. Locks in moisture and is loaded with antioxidants to combat aging. It isn’t easy finding organic shaving products for men, hoo wee, I had a heck of a time finding these ones. Sure there are many out there that claim to be organic and natural, but then you read the ingredients list and you have to shake your head. I will leave you with a short video demonstrating the perfect shave. Do you have any organic brands to share? What is your favorite shaving product? p.s this post contains affiliate links to amazon, if you click and buy, I get a tiny reward for all my hard work. Cheers! First off FANTASTIC article. Who knew there was so many options for guys. I’m a real low maintenance type of guy. My routine is to shower first and that makes my hair softer and much easier to shave. I’ve also noticed it makes my razor blades last a lot longer because they are not working as hard. I don’t use aftershave I do use a skin lotion. And after reading about the Brooklyn Grooming Anchor Aftershave Tonic I’m digging on giving that a try. Nice to see you mentioned the badger brush. I remember growing up my dad had the brush like that. He would mix up his shaving cream and then use the old style razor were you dropped in the razor blade, I think it was a gillette razor. That razor was scary and I remember thinking I don’t want to have to shave if I have to use something like that. My man is low maintenance as well, he doesn’t even shave! He sports the beard. He is also not a product user, but I know some men are. This article is for those men who use products and take pride in their shaving ritual. After 40 years of not shaving daily, yes I have a full beard, I was looking into daily shaving once again. 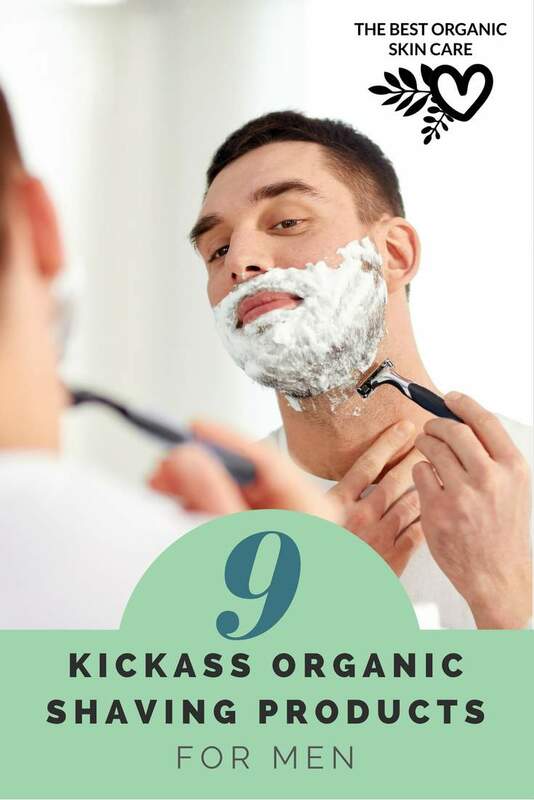 Your organic shaving products and the simple steps you have outlined will help with what products will work for me and give me comfort after my shave. I think you have given me a reason to shave again. 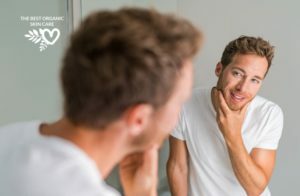 After researching for this article, I tried to convince my man to start shaving again! He grows a full beard as well, and even after I told him how to get an awesome shave, he still said, “no way”. I was looking at a recent episode of “Botched” and one of the reasons that was suggested as to why some guys may have a younger looking face was the shaving. Apparently, shaving is not just about removing the hair, but when they shave, other “impurities” get taken off from the skin as well and a bunch of other stuff. You’ve highlighted some really great products and I like the idea that they are filled with natural ingredients. I distinctly remember my brother having difficulty finding a product that would not cause him to break out when she shaved. Not sure what he got comfortable with, but initially it was a process of trial and error. 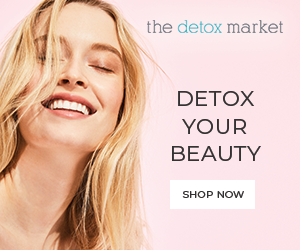 Now there are lots of options without the harsh chemicals and I am sure lots of guys and gals would be happy to encounter your site and learn about the best options they can access. Thanks Vanessa, the world of natural and organic shaving is growing. I am glad your brother was eventually able to find something he could use, sometimes it really does come down to trial and error. Yes, that barber makes me want to go get a facial shaving, looks relaxing! These products look so great! I’m now wanting to give up my electric shaver and join the group here that has the edge! John Masters Organics Jojoba and Ginseng Exfoliating Facial Cleanser – Jojoba beads exfoliate without scratching the skin. I really like the organic stuff here. My GF is all Organic, in fact we are going to be moving out to the country in a few months and have a half acre garden and become onen with the earth! Love the website and the products! Thanks Rick, that is so awesome that you and your wife are moving to the country, a half acre garden sounds amazing! Excellent resource. Ill definitely be back to refresh my memory when it comes to needing new product. 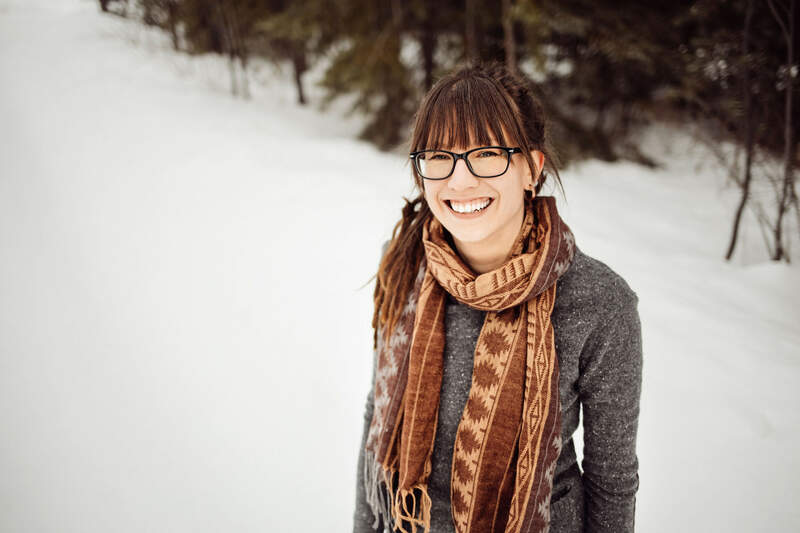 When I first read your opening article about all that nasty stuff in skin care products, I was appalled and glad that you brought it to light. Then, when I saw you’re taking men’s skin care seriously, I was really happy. As a man with sensitive skin, I’ve been dealing with itch any time I have facial hair, so a good clean shave is extremely important. If I go more than a couple of days without shaving, I get all red and splotchy. Thanks for this! You are so very welcome Patrick 🙂 That makes me so happy to hear, that you were helped by my writing. 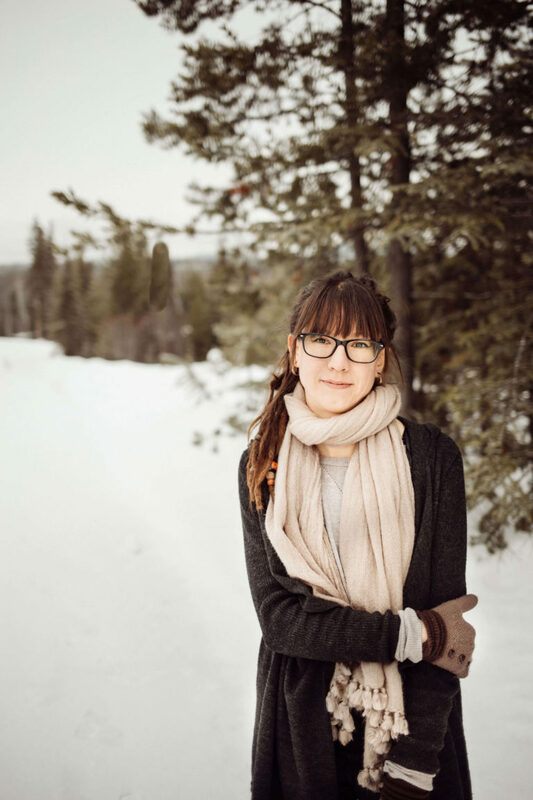 Sensitive skin is a burden many people deal with, luckily there are more and more organic companies coming out that are creating products especially for sensitive skin. Pai Skincare is one and CV Skinlabs is another.